Homemade vegetarian baked beans are a great and traditional addition to a picnic, outdoor vegetarian or vegan barbecue or to bring to any summer potluck. And, baked beans are easy to make in large quantities and just about everybody will love these sweet baked beans, even the vegetarian kids! Or, if you're British, baked beans on toast are an essential ingredient in a full English breakfast. Sure, you could pick up a can of vegetarian baked beans from the store, but these homemade Boston-style baked beans with molasses are much better and fresher, particularly if you have the time to use beans which you've cooked instead of from a can. However, if you're used to the baked beans out of the can, you might find that this recipe isn't quite as sweet (but that's a good thing, not a bad thing! ), especially since it calls for molasses instead of sugar, and no other extra added sweeteners. In a large casserole or baking dish, stir together all of the ingredients, mixing well to combine. Cover, bake for one hour. If baked beans are too saucy, bake uncovered for an additional 15 minutes. Serve your homemade baked beans along with some homemade vegan skillet cornbread. 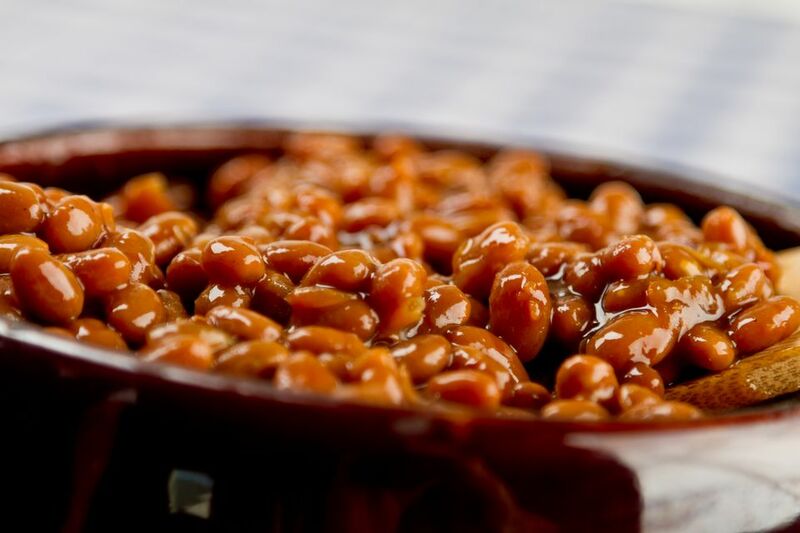 This vegetarian Boston baked beans recipe is made with beans, molasses, onion, tomato paste, and seasonings, making it completely vegan as well as vegetarian. If you need it to be gluten-free as well, swap out the soy sauce for a gluten-free substitute, such as tamari or Bragg's Liquid Aminos, and use either a gluten-free vegetable broth or water (read the label if you're using a store-bought vegetable broth, as some contain gluten and some do not).